World Record – 32 lbs. 9 oz. As you can probably tell from the species name, this one likes really cold water, folks. This fish has a fairly wide range, given its affinity to extremely cold water conditions. Mostly found in lakes or streams in Arctic, sub-Arctic, or Alpine regions, they are the ONLY species of fish to exist in Ellesmere's Island's Lake Hazen. They are adaptable to both fresh and salt water. The flesh ranges from bright red to light pink, which is great for the girls. I guess the guys just have to do their best! 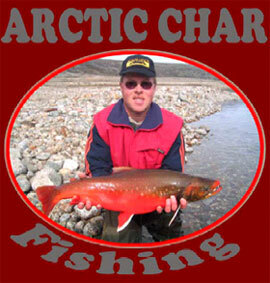 Arctic Char can grow to about 20 pounds, with a max length of 22" to 24" in the wild. Farmed individuals will have a much lower weight and length ratio, at 3 to 5 pounds and 12" in length. Until recently, these fish were understandably mistaken for the Dolly Varden trout and the Bull Trout. This is simply due to a similarity in appearance, and an overlapping of range. However, this cold water fish is the only freshwater fish found as far north as the Arctic Circle, and since they are a cold water species…you get the picture, right? Arctic Char can be found in both fresh and salt water habitats. Coastal waters along the northern Canadian border and along the Arctic Circle all the way to Siberia are home to a good population of these fish. They are also found in Alpine lakes and streams, and are native to glacial lakes in Great Britain and Scotland. Spawning is in the fall from November through March, with the eggs hatching in the early spring. Since they have many of the same traits as Salmon and Trout, they build nests called redds on the water’s bottom where the female lays her eggs. The male comes along and fertilizes the eggs. The young Char are unguarded from birth. They have been introduced into some mountainous freshwater areas of the United States with mixed results. The thought was that they would adapt better to the cold conditions of the high elevations, and give fly anglers a fish that would provide more sport fishing opportunities. More often than not, though, they actually threaten other indigenous fishes, because their diet is mainly other fish. As young hatchlings, they are sustained by plankton and organic matter off the bottom As they mature and grow larger, the diet changes to smaller creatures and other fishes, including shrimps, small crustaceans and any fish that is smaller than the Char itself. Following the patterns of it's cousins, the Trout and the Salmon, they are opportunity feeders, and eat whenever the opportunity arises. For this reason, they are a GREAT fly fishing target! Arctic Char can be prepared in many ways. 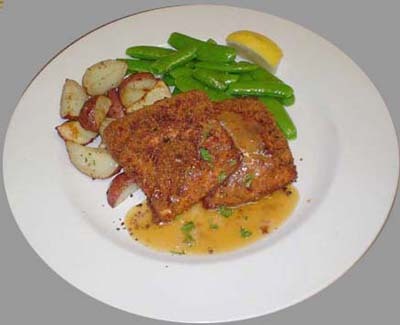 The most common is probably smoked, followed by pan fried fillets. However you cook them, always have a little wine, some butter, tarragon and onions handy! Poaching, broiling, and basting work well, too. For further information, contact us or visit our DISCOUNT STORES. CONTACT US ©2008 fly-fishing-discounters.com, All Rights Reserved.